By Dean Schwartz (SWAG Master): Successful businesses are built on relationships. 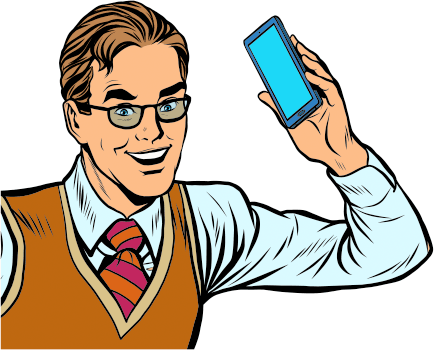 In order to retain customers and increase your revenue, you need to make sure each customer is happy with their purchase. This is all obvious to anybody over the age of 10, but what’s not so obvious is how to achieve customer satisfaction. The good news? 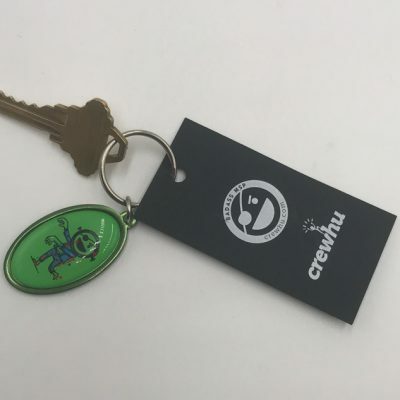 SWAG has been proven to add to a customer’s happiness (read more about that here) and SOBO can help you create custom SWAG to show your clients how much you appreciate them. 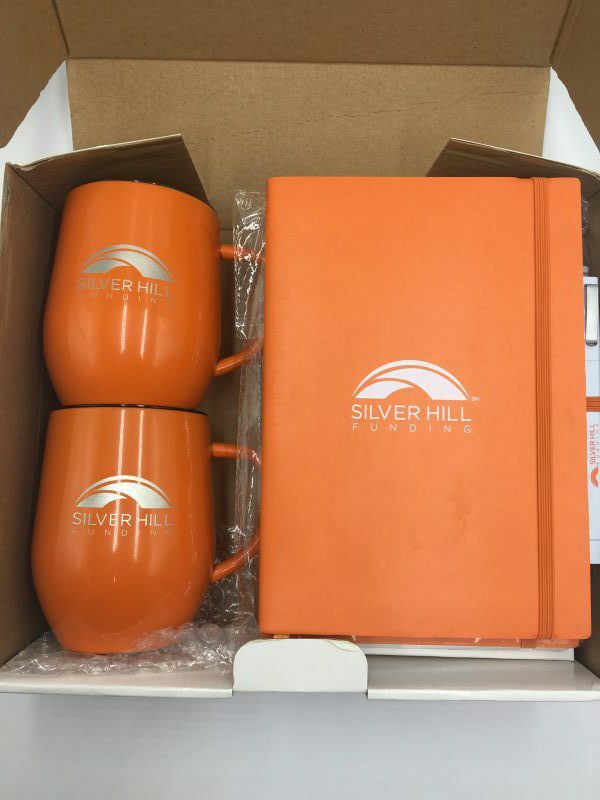 Let’s take a closer look at an example: the client gifts and packaging we designed for Silver Hill Funding. Silver Hill Funding, LLC is a small-balance commercial mortgage lender that provides financing on commercial real estate. 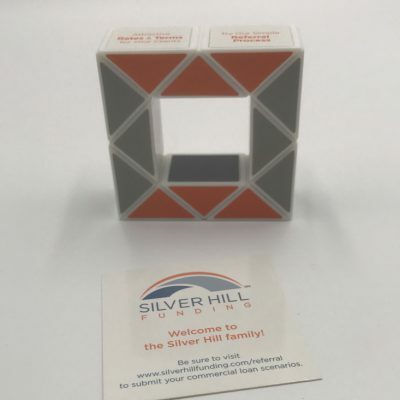 Silver Hill needed a creative way to say “thank you” to their clients following a closed deal with brokers. What better way than by sending a gift?! Of course, it was critical for the gift to be useful in an office environment. SOBO got to work and pulled together this “deal closing kit”. The kit contains: 2 insulated stainless steel coffee tumblers with a laser-etched logo, 2 custom notebooks with their logo printed in the center, and each notebook included a logo’d, modern, square pen attached. 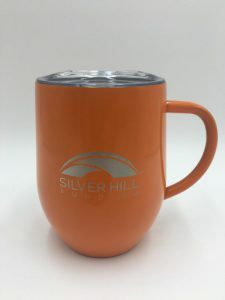 In addition to ensuring the products were useful, it was also imperative that Silver Hill’s unique orange color was matched on each of these products. Considering the difference in the products and the uniqueness of their orange, this was no small task; nevertheless, SOBO got it done. As you can see in the picture below, we custom-made the products overseas to ensure the orange mugs matched the orange notebooks. But wait, there’s more! SOBO always goes the extra mile. Our work wasn’t done yet, however. Considering the amount of time and money we invested in this project, plus the amount of work that went into creating and matching each of the products, shipping the tumblers and notebooks in a plain brown box just felt wrong- like we weren’t doing their customers justice. We needed to add some more SWAG with Style! 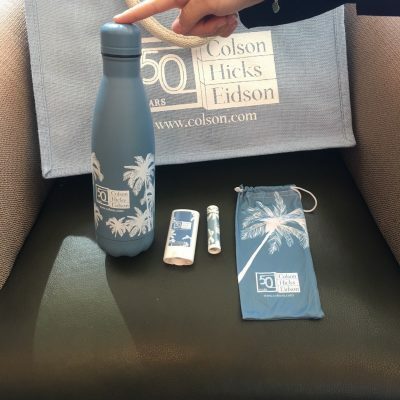 Our goal was to ensure that Silver Hill was represented favorably by this “deal closing kit”, especially considering it’s the last chance to leave a positive impression with their customer; so, we created eye-catching gift packaging to add a premium and exclusive look to their kit. 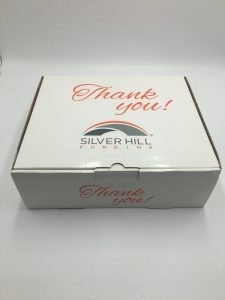 The box was custom printed with “Thank You” prominently displayed and the Silver Hill logo represented on all sides. Since the box they chose was white, we also needed to ensure it remained clean during the shipping process. We decided to shrink-wrap the boxes so that it arrived looking brand-new and in pristine condition, and our decision worked like a charm! But we weren’t done with this project yet- we had one more challenge to overcome. Silver Hill doesn’t have space or resources to ship the boxes to their customers as they close deals. 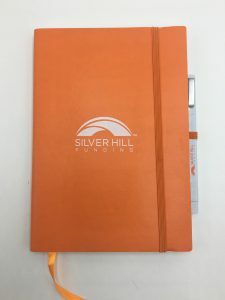 To make things easier for them, we had Silver Hill send us an excel sheet each month with names and addresses of the recipients. We took care of the rest, including warehousing, labeling, and shipping. It was one less thing they had to do each month, and they were thrilled with the final outcome. Takeaway: keep your clients happy at all costs. We go the extra mile to make sure our clients are happy, and so should you. Give SOBO a call at 888-752-0432 to design client gifts of your own and start building those client relationships!